Can You See the Mud Clouds? This was a new spot I'd never fished before. The quantity was certainly there. Hundreds, if not thousands, of carp. Commons and mirrors. The fish weren't as large or rowdy as Blackfoot carp, but it was great to get back out on the water after weeks of non-stop rain and wind. Blackfoot carp still have their alarm clocks set on snooze, but - with the welcome break from our brutal storm pattern - I expect the big'uns over there will be on the prowl in the coming days. 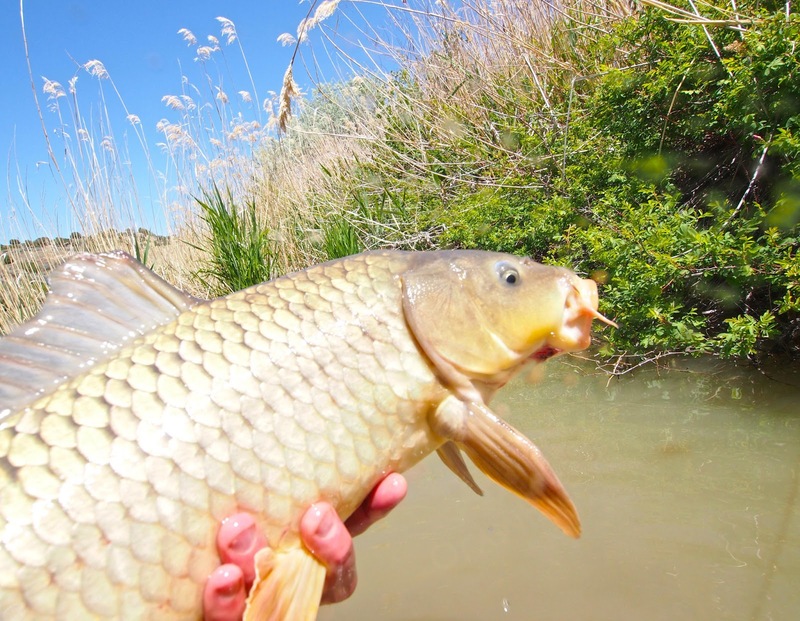 Let's face it, if you're going to host a carp tournament in mid-May at Blackfoot Reservoir, you're rolling the dice. May is by far our wettest month of the year, with triple the average precip versus July or August. This year, once again, the weather was nothing short of craptastic. I get it - most of the participants will be guiding clients full-time starting this week, so the scheduling window is a small one. Still, you can bet dollars-to-donuts you'll get rain, wind and snow in the high country this time of year. When that happens, the carp don't eat. Deja vu - 45 degrees with dark skies and increasing winds. We spent the first few hours of the tournament on the move, scanning the water for active fish. There were a few carp up in the shallows but they weren't buying what we were selling. Cast after cast went unrewarded until Chris spotted some feeders from atop a small cliff. After scrambling down into range, he pulled a rabbit out of his hat and landed this 27.4-pound fatty. His fish got our team on the board and it was the largest carp of the day for the tournament. You'd think this glimmer of hope would be enough to keep us going, but the fishing went from bad to worse. After six hours of lousy carping, we decided to ditch the tourney and go trout fishing in the river below the reservoir. It was a nice diversion and I was able to get the skunk off. After a couple of hours of troutin', we returned to the tournament where Chris received a prize for his hog. The weather went from lousy to "even lousier" and I had a dilemma. 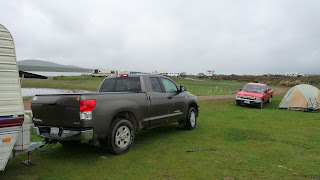 The dirt roads surrounding the reservoir turned into pudding and I had an 18' camp trailer to haul back to town - plus a plane to catch in the morning. I decided to skip the rest of the tournament to head back to town before the situation got any worse. This turned out to be a good call as the trailer barely made it up the hill above the Poison Creek boat ramp. 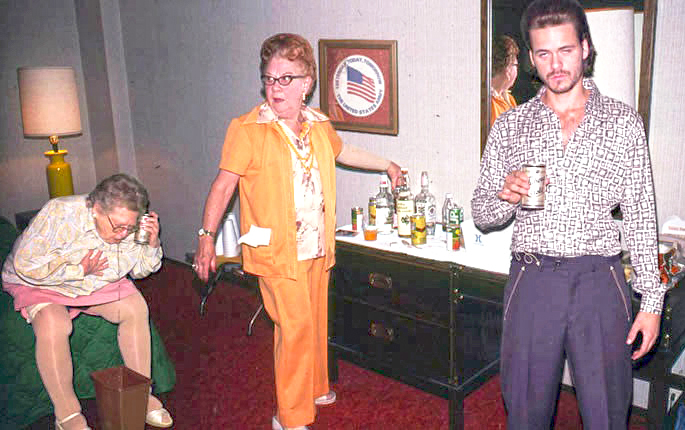 I made it home but missed the post-tournament after party, which was apparently 'off the hook.' Most of the photos are not suitable for a PG-13 blog such as Uprising, but here is one Shane sent from his phone. East Idaho clearly knows how to party. The difference between "epic" and "effing skunked" at Blackfoot Reservoir can be summed up in one word - sunlight. When the sun is out, they feed. Otherwise, forget it. Chris and I got out with Miss Lucy today for some pre-tournament recon. 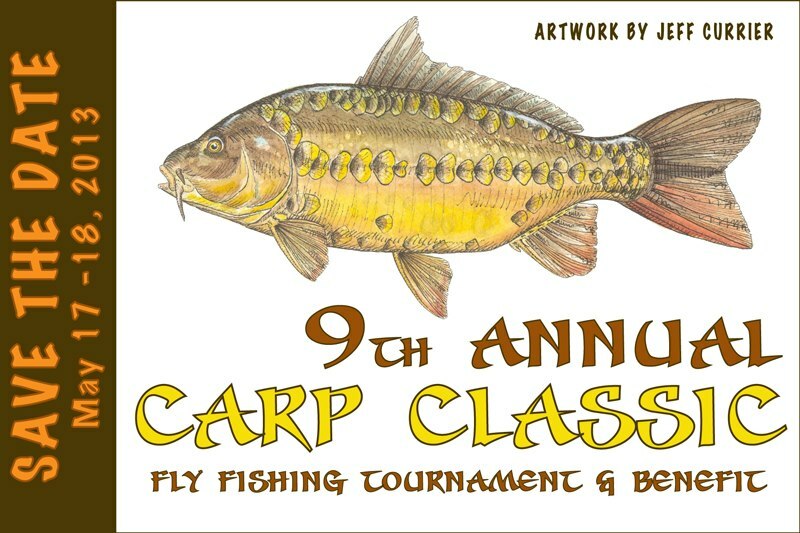 Yep, the 9th annual Carp Classic fly tournament takes place next week. I'll be hauling the Uprising Mobile HQ 18-foot camp trailer down there and it is sure to be a hoot. Our team (tentatively known as "Cloop USA") is armed and ready. 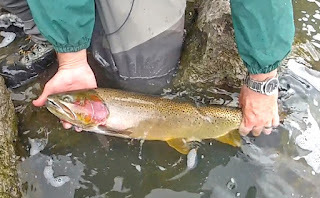 It gets pretty darn cold at night at Blackfoot Reservoir this time of year, so the bite usually does not turn on until about 10:00 a.m. Such was the case this morning when we arrived, as carp started moving onto the flats in time for brunch. We got into a few decent fish from the get-go, but the morning was pretty sluggish overall. The "rip your arm out of its socket" takes I look forward to here were non-existent and we had to work hard for every subtle eat. Where were all the rowdy bastards from last spring? The fat girls were noticeably absent from the dance and some nasty storm clouds began to roll in. We decided to switch gears and move to a flat where hogs are always found. The hogs were there, but their appetites were not. The clouds took them away. Nonetheless, we were able to assess the appropriate strategy, given this year's low water levels and altered flat configurations. Chris picked up one last carp on our way out, but the afternoon was otherwise a bust. Other news this week: a "game changer" upgrade in the Uprising photography department: new camera, underwater housing and wide-angle wet lens. It's on. 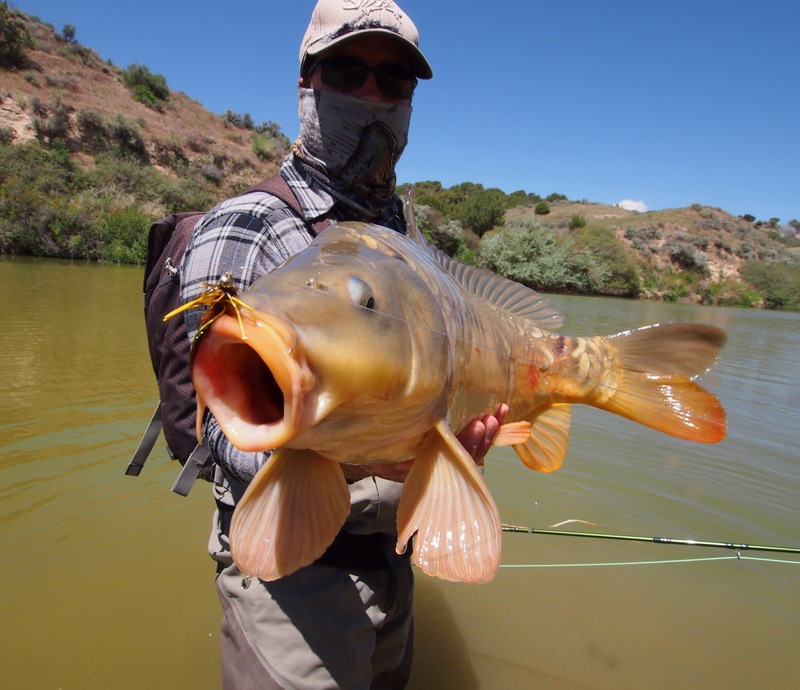 Around here, we have an abundance of very large carp that live in muddied-up bogwaters with very low visibility, which makes sight casting a challenge. Most days, you're not going to see them unless they are tailing. 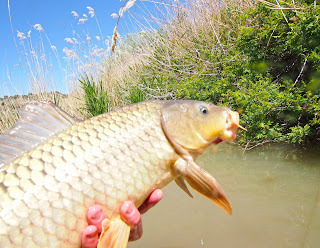 Fortunately, there is a brief window each year on the Snake River where water levels are just right and carp come out of the deep and onto the banks to feed. That window is currently open. 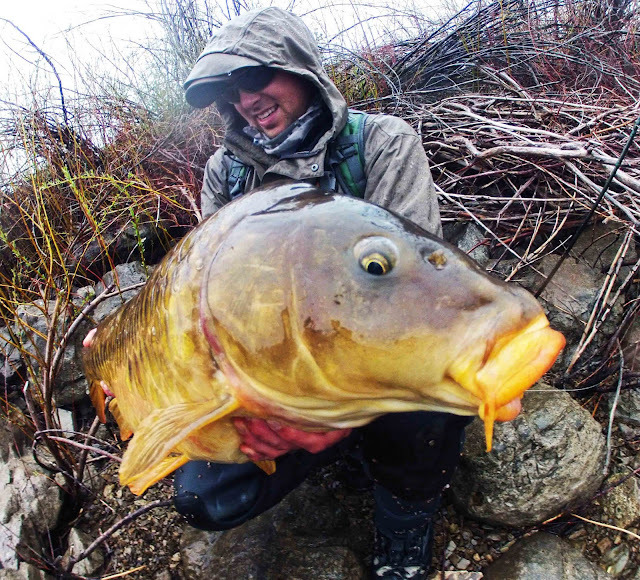 Blackfoot Reservoir carp are famous the world over, but our Snake River carp are a breed worthy of special attention. They are much less aggressive than their neighbors to the east and exhibit very different personalities. Unlike Blackfoot, the Snake River is not a venue for stripping flies - due to a plethora of lava rock and brush snags. 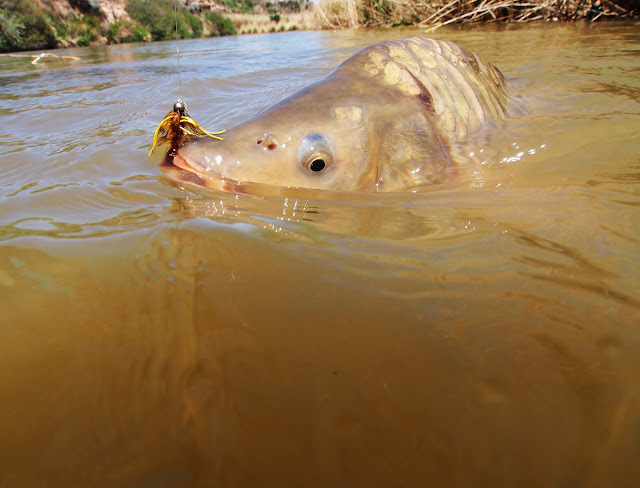 Not that it matters, as these river carp seem generally unwilling to move towards their forage anyway. Their takes are nearly imperceptible. 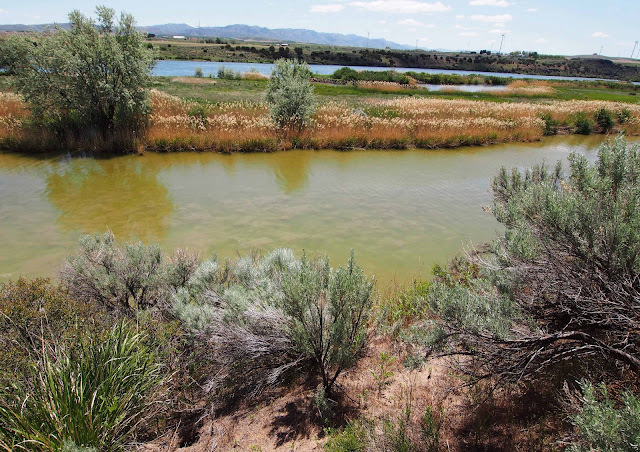 Snake River carp move lazily along the river bottom like a pack of happy vacuums. The best you can do is lob your fly into their path of travel and dap 'em if they hover over your fly and tilt their heads to slurp it in. Maintaining a visual on your fly is critical - as takes otherwise go unnoticed. Feeders are usually produced in one of two scenarios - laid up carp along the banks or cruising fish out in the river, just inside the current seam. Adding current to the "moving fish + wind + roll cast" scenario enhances the challenge. These fish are infinitely more challenging to catch than their bretheren up the road in the reservoir. In my opinion, this is as good as carp fishing gets. Soon, spring runoff will be here and the river will become a blown-out chocolate slurpee - but right now there's a whole lot of fun to be had on the Snake.